Why Portland Window Tint should be Installed in Every Home? There are several pros of home window tint, also known as solar window film, which is applied to the interior side of windows. This allows installation to be much easier and quicker. Installing home window tint is done less for a decorative purpose, like it is with decorative window film that is applied inside the house. Instead, the main function of solar window film is to deflect the direct sunlight. There are a few reasons why you might want to do this such as the following. Prolonged exposure to direct sunlight is just bad for you. It can cause damage of the skin which leads to premature aging. It can also cause dry skin which involves itchiness and rashes, not to mention the higher chances of of skin cancer. Home window tint blocks 99% of the ultraviolet light that causes such damage. It is a good idea to control your exposure to sun as much as possible. Save the sunlight exposure for doing fun things outside. Protect your home from the dangerous rays. The Sunlight that comes into the house is great for fading carpet, drapes and furniture. The heat from it can also damage electronics and digital items and cause wood to warp. In addition to its blocking power, solar window film can passively reflect and absorb up to 70% of incoming solar heat which keeps it from entering the house. Don’t put up with damage from “natural elements” inside your home. Protect your material items, keep them in excellent shape and make them last longer. Does your home life consist of constant arguments over the utilities bills? Whoever is in charge of paying the bills can be a real nag when it comes to outrageous energy bills. Nobody likes to be told not to turn on the air conditioner when they are really hot. Home window tint is the solution! 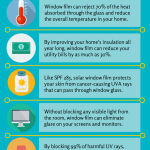 Solar window film decreases the heat that comes in from the outside which make it easier and cheaper to keep the house cool in the summer. It also has an insulating effect that will keep in the heat in the house during the winter, which will drastically decrease your electrical bill. Privacy is important, but why would you want to keep your shades pulled down all the time? Home Portland window tint creates that privacy during the day and it doesn’t interfere with what you see outside! Home window tint comes in various and different types. If you want to protect the privacy inside your home, choose a tint with a higher reflective rate. This way, you can see out but you can’t see in during the day. At night it does not create as much privacy, so it is always good to close the blinds at night. While the main purpose of solar window film is not a decorative purpose, it can make your home look better from the outside. Curb appeal is important to most homeowners. When decorating the inside of house, you are not going to use curtains that don’t match in one room. So, why would the outside of your house show different colors of curtains? Home window tint will block or obscure the view of the things that are inside the house for the exterior (depending on its reflectivity). Solar window film comes in many colors and shades as well so it can complement your home’s style. Pacific Window Tint offers all kinds of window tint for different functions, such as graffiti protection, Solar UV filter, Safety and Security and Privacy Window Films. Let Pacific Tint take care of you and your Portland Window Tint project.